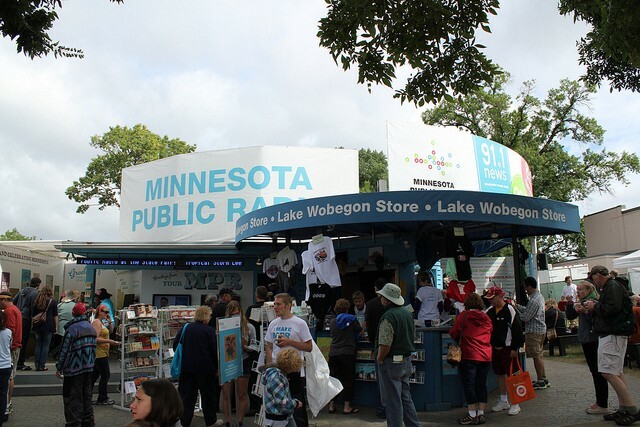 I was indoctrinated into the cult of the Minnesota State Fair six years ago. At the time, it was sort of a goof with my then-girlfriend, now-wife: we were dating long distance between San Francisco and New York, so it was an excuse to meet halfway and in her hometown. Twelve hours, two orders of fried cheese curds, several Leinie’s and a live taping of “A Prairie Home Companion” later, I was hooked for good. I’ve only missed it twice since. (Once, for my wedding, and then last year, because my very-expectant wife was grounded.) Now, the Fair is as much of a Labor Day tradition to me as no longer wearing white shoes. Or switching from gin to brown liquor. 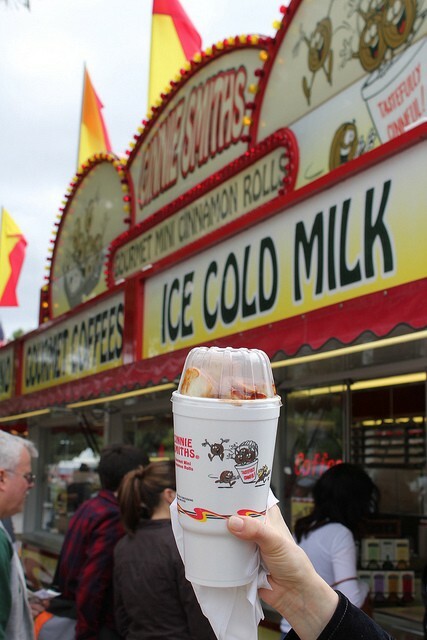 The key to surviving the fair — and yes, “surviving” is a goal — is portion control. Most Fair fare should be shared, with few notable exceptions (three on a corn dog is bad luck). 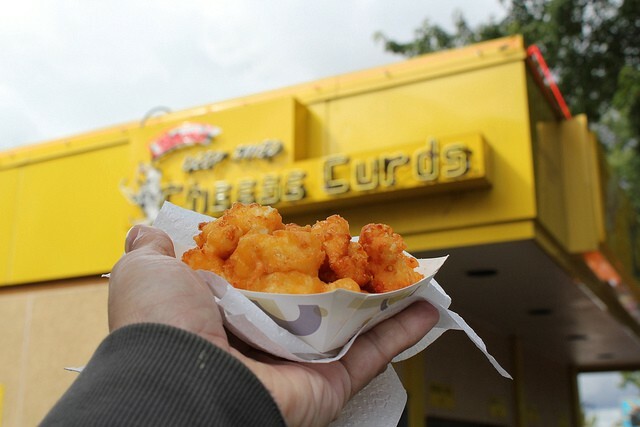 It’s a marathon, not a sprint, so splitting an order of cheese curds between four people will ensure that you are still in fighting form hours later at the Leinie Lodge. I’m not gonna lie. Somewhere around the chicken-fried bacon, things went a little south. One bite would have been enough — a whole strip of the stuff was too much. 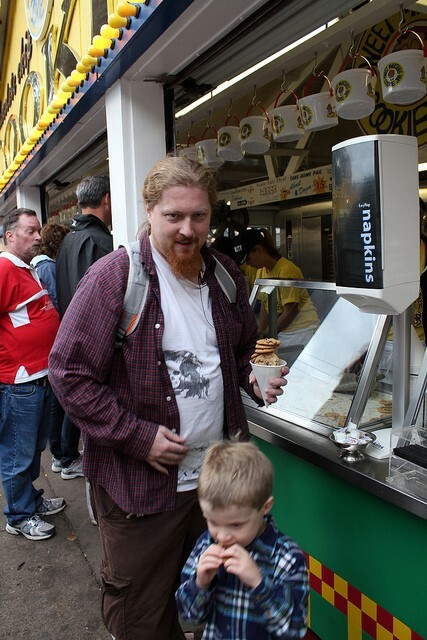 My first year at the Fair, I was a machine (I guess enthusiasm goes a long way). Now as age, parenthood and inertia have caught up with me, the fair bouillabaisse requires stamina and vigilance. Too much of one thing, a bad combination here or there, and you start scanning the fairgrounds for the Pepto-Bismol-on-a-stick booth. 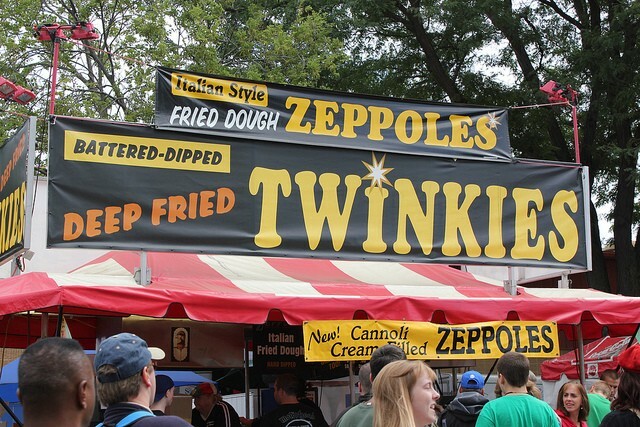 Over the years, I’ve experienced a few clunkers: deep-fried Twinkies are terrible, fried candy bars are overrated, Scotch Egg On A Stick disappointing. While my brother-in-law favors chili dogs, I eschew items that I can get at the ball game. 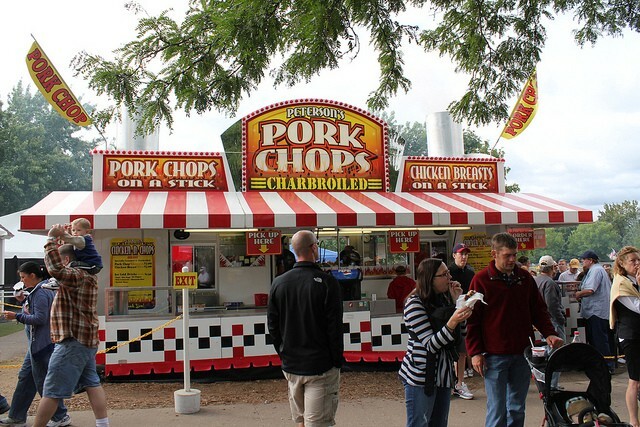 I love the offerings that are unique to the Fair or scream Upper Midwest: Walleye anything, pork chops, cheese curds, corn. As you eat, throngs of Midwesterners swirl around you, their woodland camo, Minnesota Vikings gear and Chaska Hockey sweatshirts making a rainbow of fruit flavor. Looking around, you can forget that Minnesota was the state of Mondale and Wellstone, but scattered around the fairgrounds are signs that Minnesota remains a liberal populist state: taking a break between adventures in gluttony, I filled out a survey for earnest-looking Al Franken volunteers with comically oversized campaign buttons. Disappointingly, the survey did not include questions concerning whether or not I had visited the Oink Booth or who my preferred cheese-curd purveyor was. Later, I’d see a Michele Bachmann scarecrow in the Agriculture Building and browse Guy Noir t-shirts the Minnesota Public Radio booth. But yeah, the food. Oof. 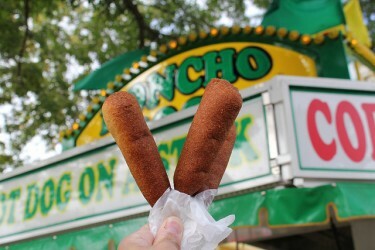 I always start the Fair off with a corn dog. It just seems… right. This offer greets you as you navigate past the Miracle of Birth building near the entrance. 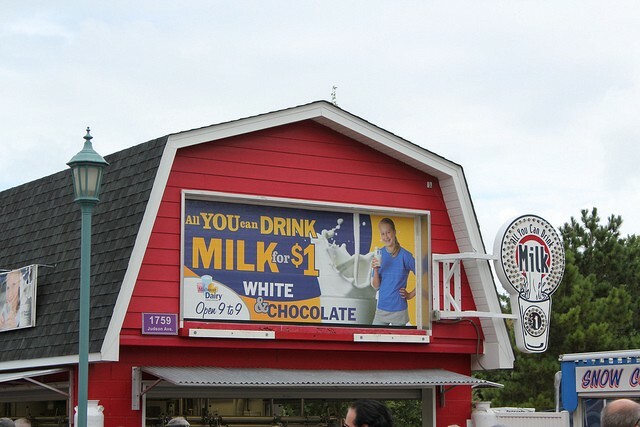 Both “white” and “chocolate” are available. Is “white milk” a thing? 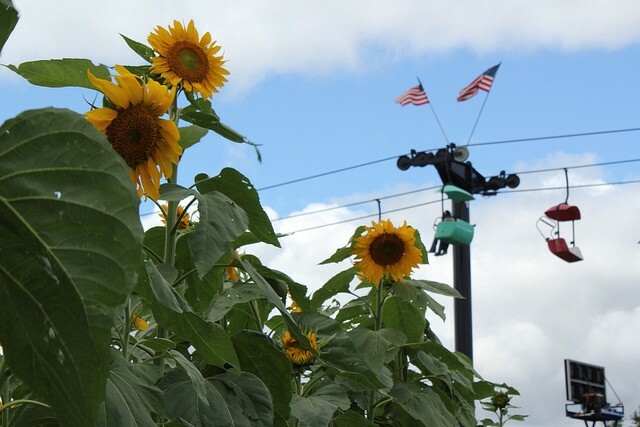 According to a reliable source (read: my father-in-law), the top 5 sellers at the Minnesota State Fair are: french fries, Sweet Martha’s Cookies, cheese curds, corn and ice cream. With sales of $2,209,697 in 2009, Sweet Martha’s Cookies outsells the other four. Combined. One of my all-time favorites — and actually, one of the healthiest things at the Fair. 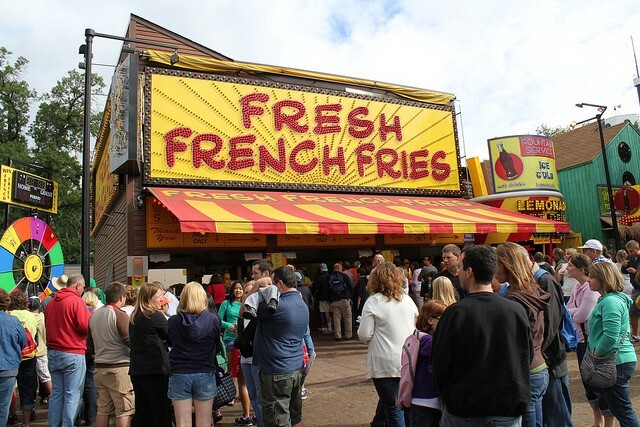 While no Sweet Martha’s Cookies, the two french-fries concessions rake in about $900,000 annually. Over half of that is profit. 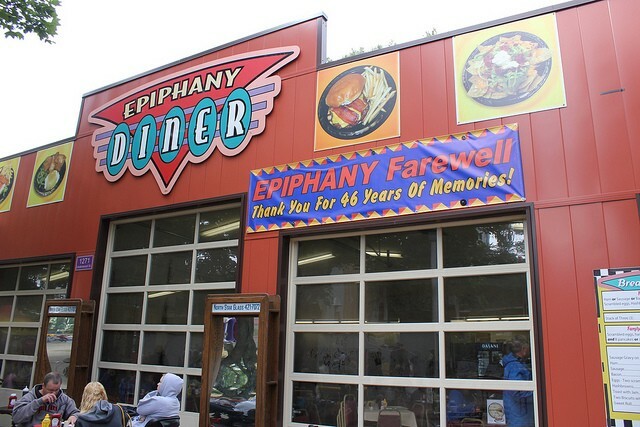 Since 1965, this church-sponsored diner has served fairgoers with simple food that just could not compete with stunt food like deep-fried Oreos. With sales lagging and needing a new roof and fryer, this was the last year of the Epiphany. A staple of the upper Midwest, do not ever attempt to eat a serving by yourself. Sometimes lost in the spectacle of gastro-excess is the nice simplicity that lies behind the idea of a state fair: populist, agrarian, family-oriented. 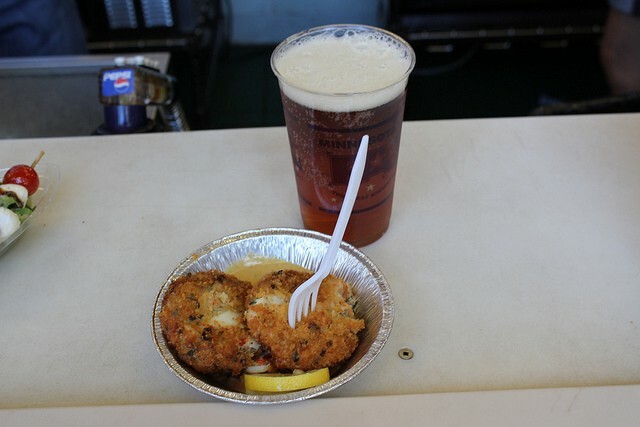 Walleye cakes with a Summit Extra Pale Ale. 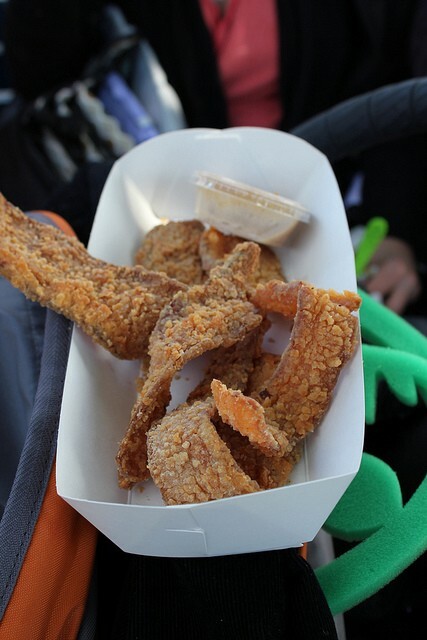 Fact: One bite of chicken-fried bacon is enough. Warm mini cinnamon rolls served with cream cheese frosting. Worth the walk to the outer reaches of the fairgrounds to get them. Actually, justification for said walk. The Grand Dame of state fair stunt food. Never eat these. 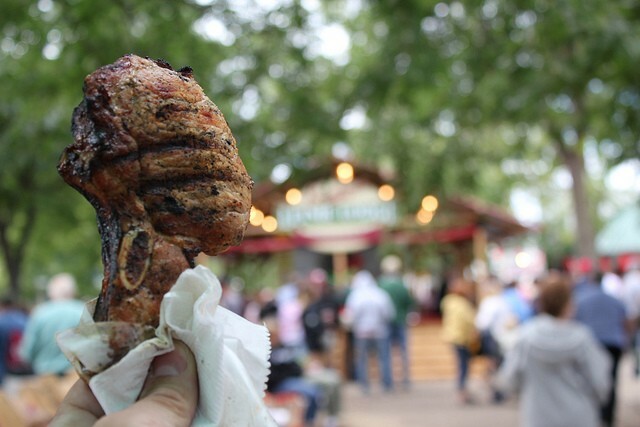 Pork-chop-on-a-stick at the Leinie Lodge. 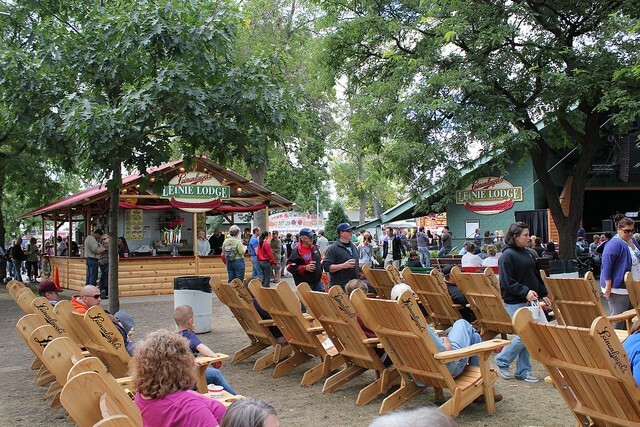 The ideal spot to take a load off and enjoy six varieties of Leinenkugel beer while listening to some of the best Swedish Christian folk music around. 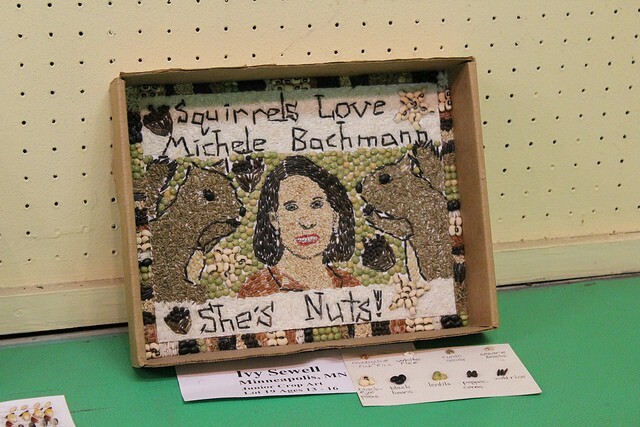 Celebrating the artistic use of our land’s great bounty, the Crop Art exhibit at the Minnesota State Fair always features some of the best political and populist sentiment ever to be rendered in grain. 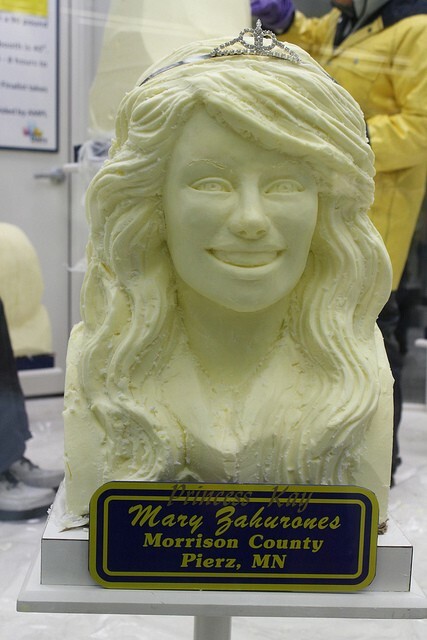 The epitome of wholesomeness: the twelve finalists for Princess Kay of the Milky Way have their likenesses reproduced in a block of butter, known as a Butter Bust. 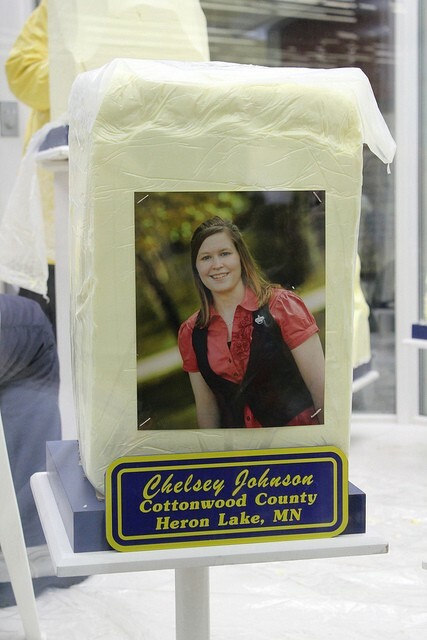 The contest’s twelve finalists must come from working dairy farms. Apparently, finalists get to keep their Butter Busts, and use them to cook with throughout the long winter. 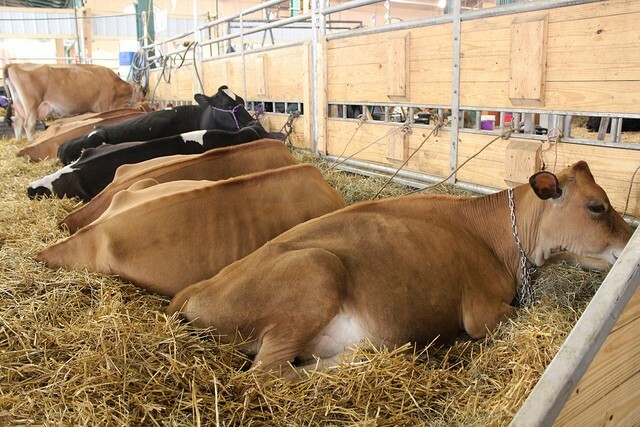 Livestock have a central presence at the fair, serving as a helpful reminder of where our Butter Busts come from. Replica of a Williamsburg apartment. Just kidding. 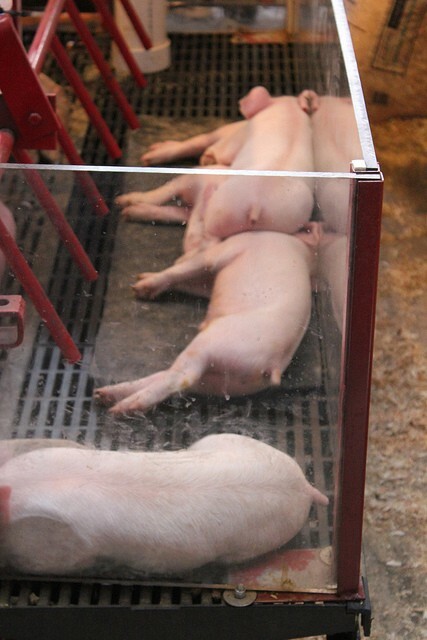 While looking at these piglets, try not to be reminded of where bacon comes from. 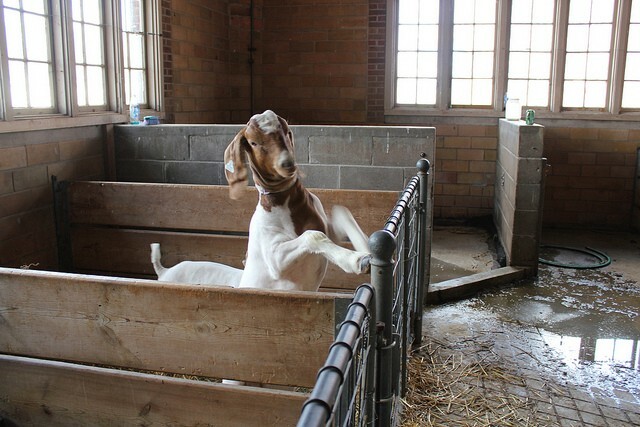 Most of the livestock barns are set up to allow close contact with the animals, an acres-large petting zoo with Purell at each entrance and exit. Of course John Ore knows that Minnesota is the #1 producer of turkey in this country. Duh!